» TV Landscape Makeover in Bradenton: how to do Florida: Flip Your Yard! 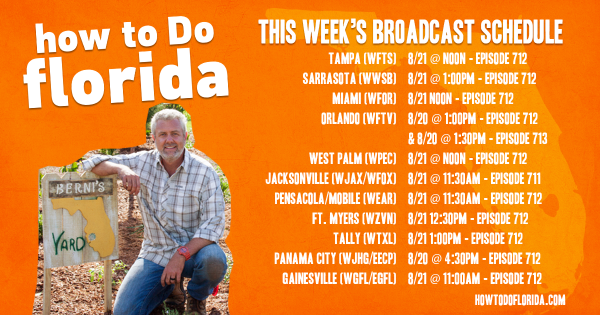 HowtodoFlorida schedule of Season Seven, Episode 12 - FLIP YOUR FLORIDA YARD. FANN sponsored the transformation of Berni and Brad Volkmann’s front yard in Bradenton, Florida, from sad turf with a few nonfunctional plants to a beautiful blooming and lower maintenance Florida native plant community attracting birds, butterflies and more pollinators. We removed 3/4 of the turfgrass, retrofitted the irrigation system, planted an edibles garden and found places for some of the owner’s favorite well behaved non-native plants. All in one day! The transformation represents about $10,000 in design, installation, irrigation, hardscape and planting.